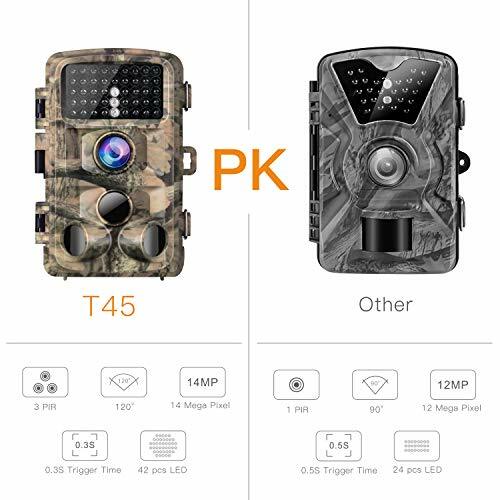 CamPark T45 14MP Digital Trail Camera comes with a 14MP camera and supports up to 1080P video. 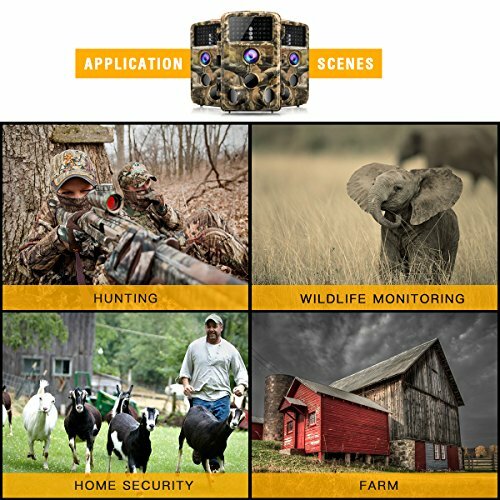 It’s a high-quality trail camera, that comes with a small price. In today’s review, we tested the camera in close by forest to see how well it works and how easy it is to set up and use. 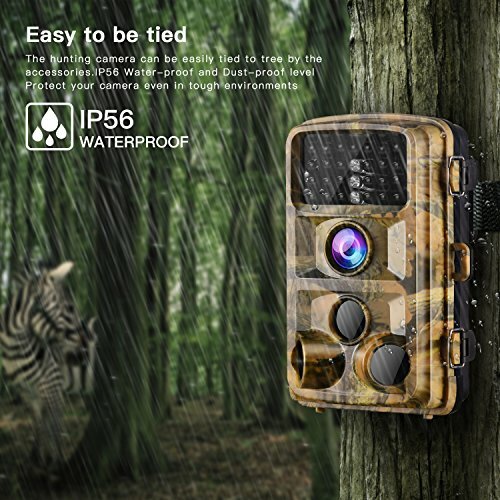 The CamPark T45 14MP Digital Trail Camera comes as do many other wildlife cameras in camouflaged color and it is waterproof. As for the design, it feels sturdy and good in the hands. On the front, you can see the camera, 42 IR LEDs on top and three infrared motion detectors, which is a nice addition. The motion detector can capture motion from up to 65 feet (~20 meters). On the backside, you got the connections which are the basic strap to hook it on a tree, but you also get a mount that you can use to permanently attach the camera. A great small feature if you wish to use the camera as a security camera. If you open up the camera you can see the buttons to operate the camera on the left, the screen and on the bottom micro SD slot, AV output, Mini USB you can use to attach the camera directly to your PC and the on/off switches. On the right side, you can see the place for the basic AAA batteries you need for the power. In the box you can find: 1x Hunting Camera, 1x Belt, 1x Tree Mount, 1x USB Cable, 3x Screw, 1x User Manual, 1x Support Card. 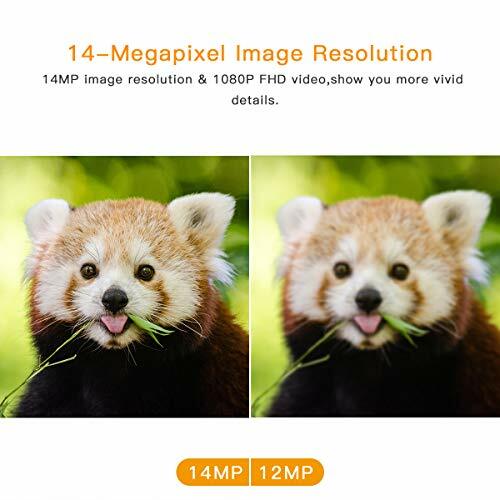 The camera comes in a 14MP and supports a full HD 1080p video, which should be more than enough for most users. 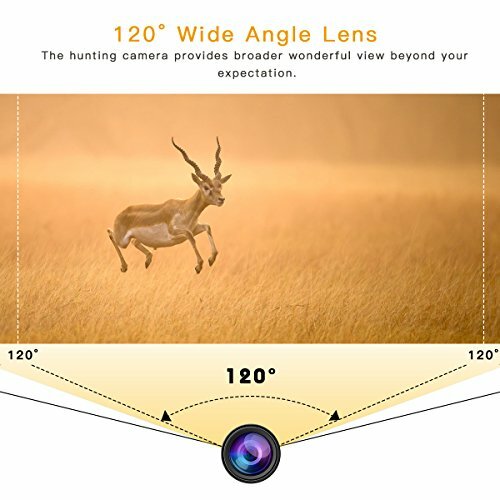 It has a wide viewing angle of 120° which is a nice little extra compared to other similar products which usually only have around 90°. 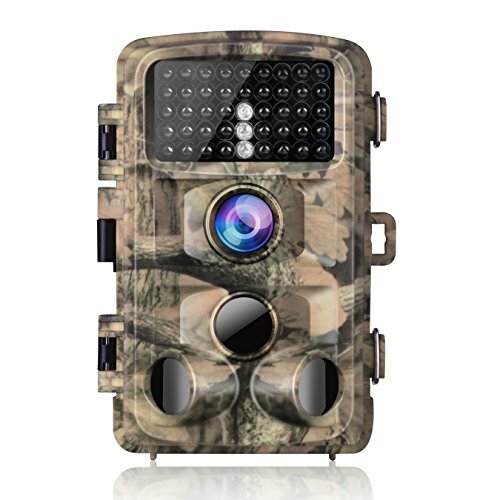 The CamPark T45 14MP Digital Trail Camera is equipped with night vision. 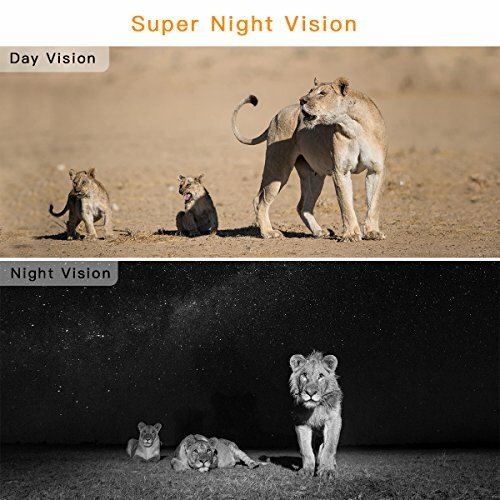 In our tests, it worked quite good, but if you want to take some close by images of birds, deer or other animals that might move at night, consider adding something to block few of the LEDs because they might overlight the images a bit. This is in no terms a bad thing considering that further away objects and animals are seen much easier, but it does make taking photos and videos a bit hard if the camera target gets too close to the camera. Going back to the videos there is one thing that bothered us in testing and that is that the highest resolution only offers around 25 FPS. So if you want a smoother framerate for your videos, you should go for a smaller resolution. Personally, this didn’t bother me too much, but I do understand that it might be a deal breaker for some. As mentioned earlier the camera runs on six AAA batteries, so get ready to buy some quality ones, or you might run out of power quickly. Personally, we didn’t see this much of a problem since batteries feel like a good choice for a product like this. A battery might last longer, but again if you place the device outside for wildlife, you might not want to carry a huge extra battery with you to the forest just to change it. Using the CamPark T45 14MP Digital Trail Camera is pretty straightforward. The menu is easy to navigate and the modes you can select are simple to understand even for a first-time user. Few mention worthy things on the menu and setting up the camera are the live view and the possibility to take up to 10-minute videos when the motion detector notices something. 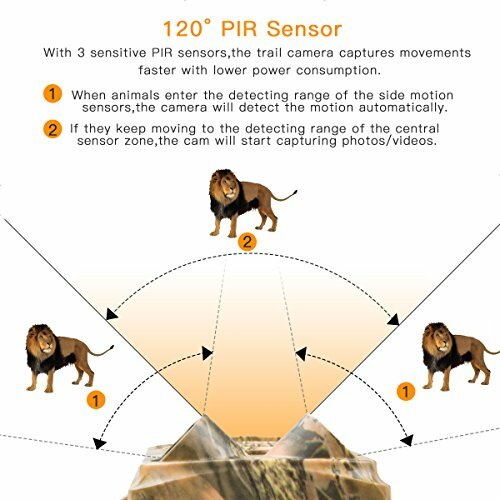 This is a great feature if you don’t want the camera to cut out every 5-seconds as some other wildlife cameras might do. CamPark T45 14MP Digital Trail Camera supports up to (Class 10) 32 GB MicroSD cards. Few things to notice before using any MicroSD card with the camera, you should remember to format the memory card to be safe and to ensure that it will work. 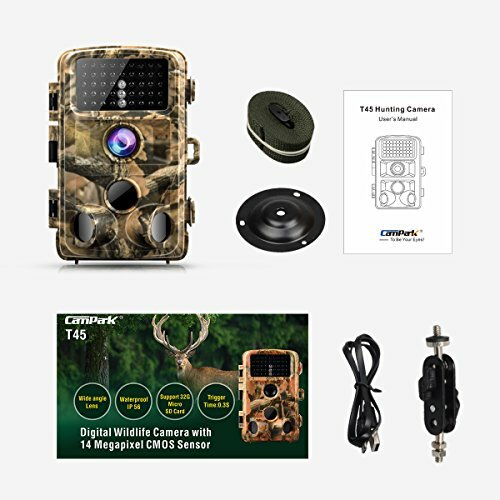 The CamPark T45 14MP Digital Trail Camera is a great pick for anyone who wants to capture wildlife day or night. It also works really well as a security camera for different areas as long as you remember to switch out the MicroSD card and batteries from time to time. I like the camera, its easy to use, takes great Vids/Pics on high res., and I was enjoying using it UNTIL I tried to put back the micro SD card and there is a space above the slot where it goes. I put it in there by mistake and the card went into the camera body. We took the camera apart carefully (my husband works with electronics) and then got the SD out and put all the pins etc back, circuit board, infrared part and then it didn’t work properly. I also had some prior trouble which I read on Amazon made mine a lemon. When set for 45 second vid, it only actually recorded 15 seconds at night. Would I buy again? Probably not. I was going to try to tangle with Amazon to return, but then the SD issue occurred. Badly designed SD slot, as you cannot really see the open space when the camera is on the table.